Monday Modern Parable ~ The Pole | Holy. Just. Love. Have you ever done a ropes course in the air? They are usually about 20 feet off the ground and terrifying. The very last thing you must accomplish before jumping to the ground is something that most fail to complete. They chicken out. You must shimmy up a telephone pole about 10 feet high. Remember you are 20 feet off the ground to begin with. Once at the top of the 12 inch in diameter pole you have to gingerly try to stand upright on it. It is almost impossible to do so especially with the blood pounding away in your ears. Once balanced precariously on top of the pole you have to reach out and jump to the bar swing that is your only safe way to the ground. If you fall, your harness will catch you, it may hurt a bit, and will definitely bruise your ego, an idol of sorts. So, maybe you don’t have a golden calf in your house or a tiki god that you pray to each morning. Or, maybe you do. In any event, the majority of people today think we are without household idols that were so prevalent in Old Testament times. We could not be further from the truth. My alter is high. My alter is only built with enough room for one person like that ropes course pole. I have placed myself so high on my own alter that I cling to it with all my life fearing that if I let go I will fall to my death. If I fall off balance for just a split second my ego will be damaged and slammed to the ground in despair. Father forgive the sin of myself. I have placed myself on my own alter and have created an inescapable idol of myself. But there is hope. Swap spots with Jesus. He took your place on that pole. He holds you firm with three nails firmly driven into the wood of that pole. Jesus has overcome the fear of the pole. He rose above it and has perfect balance and perfect reach to God the Father. He will lift you up to reach the impossibly high bar set forth that is the glory of God himself. Only through Christ is there true safety and true grounding life. 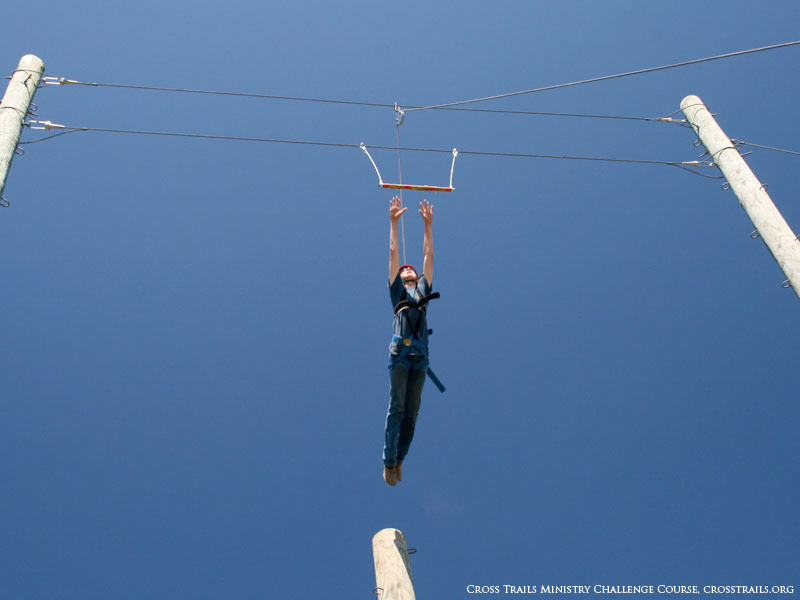 I have been a ropes course facilitator for a REALLY long time and often during debriefing the element you describe here (Leap of Faith, Pamper Pole, or whatever the particular adventure site calls it) I pull participants’ experiences back to biblical truths. Ropes courses enable us as facilitators to help participants see and understand intangible principles and concepts in a tangible, experiential way. Never have I thought of the metaphor you’ve described. I love it and it is SO applicable. Really cool perspective! Doing that course was so profound for me. What a great joy you must have in being able to share those Biblical truths often and be able to see the person’s “a-ha!” moment each time! Oh, definitely! I work primarily with middle and high school ages and watching the wheels turn in their heads is so neat. Once we get to the life application segment of the debrief those light bulbs just start glowing!! So cool. Reminder to please re-subscribe at http://www.HolyJustLove.com as I’ve switched hosting plans.